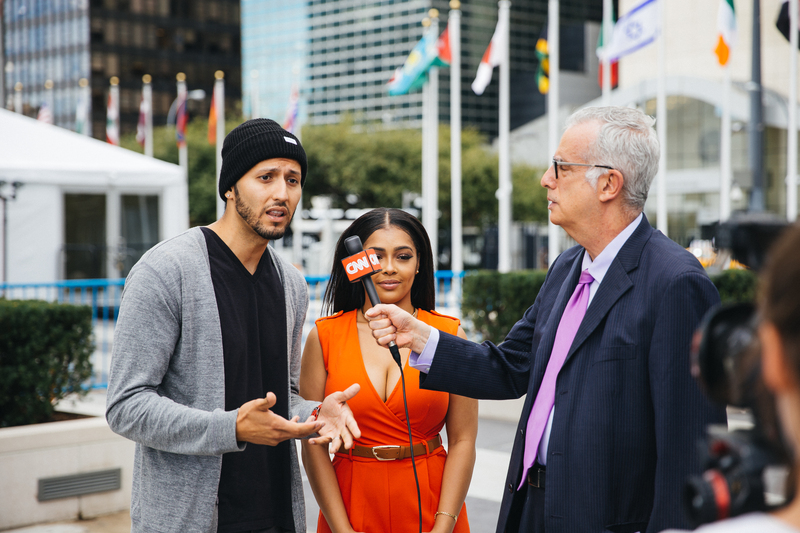 What do you do when the UN calls and asks you to write and perform a rap song for hundreds of students, distinguished Nobel laureates, and celebs like Stevie Wonder, Leo DiCaprio and Michael Douglas? Well at Flocabulary, we go forth and rap! Last week, Flocabulary had the unique honor of performing our song Sustainable Development Goals live at the UN for a student event commemorating the International Day of Peace. Our rappers Ike Ramos and Nitty Scott MC tore up the General Assembly hall, bringing people to their feet and making them clap to the beat (yep, that’s Ban Ki-moon and Michael Douglas gettin’ down to Flocab in the front row). As declared by the The UN General Assembly, the International Day of Peace is observed worldwide on September 21, right at the start of the start of the UN’s General Assembly annual session. The Sustainable Development Goals came into effect in January 2016 and will guide the United Nations Development Programme for the next 15 years. Students can learn about the Sustainable Development Goals in the classroom with our video and corresponding activities on the topic. After the event, Ike and Nitty had the chance to chat with CNN about our work, and even performed some bars a capella. Watch the Facebook video clip here!